This weekend, Keegan and I lived it up! 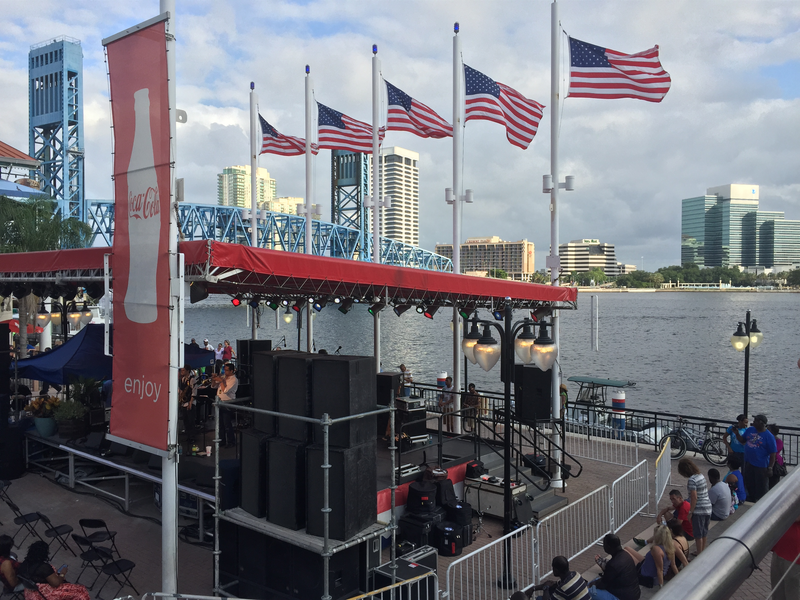 We started the weekend off with a twist and a snap of our fingers at the Jacksonville Jazz Fest downtown! 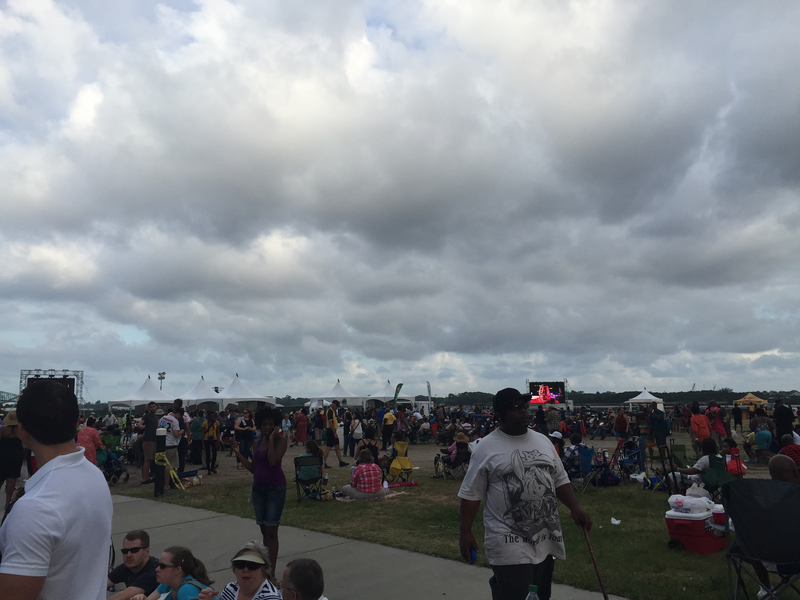 It was my first time being in downtown Jax, and it was my first jazz festival–both were very cool. There were different stages and venues set up throughout the downtown area featuring local and more well-known jazz artists. Then we went to American Grill to watch the artists play from the outdoor patio, and that place was not our fave. Service took forever, and Keegan’s bar stool was falling apart. Probably won’t be going back there, but Keegan and I got a laugh out of it! Then we went to the heart of the fest, there were hundreds of people on walking around and sitting on blankets, soaking in the music from all of the talented artists. It was a very cool sight. 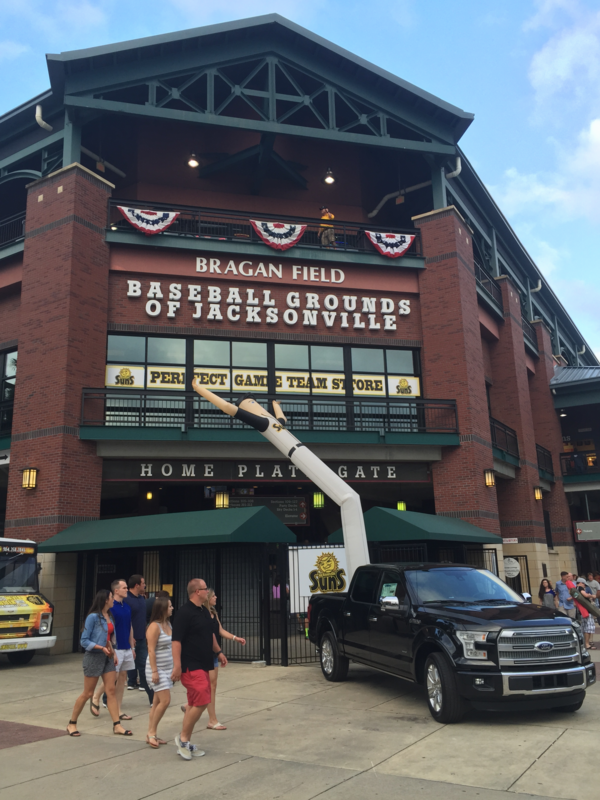 This was a cool minor league stadium. The facility is fairly new and the grounds looked well kept. Even though our team was shut out, it was a beautiful night for a ball game! 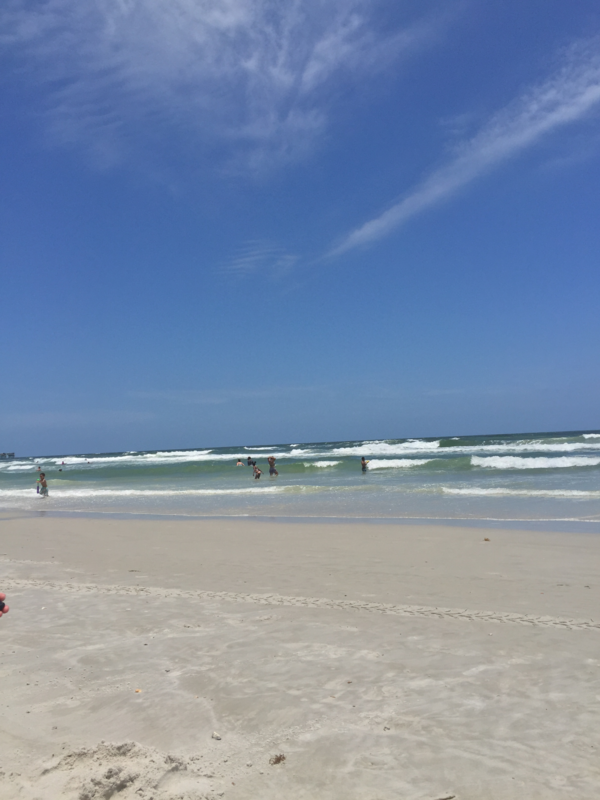 On Sunday morning, we woke up early again and spent the whole day relaxing at Jacksonville Beach. As you know, I’m definitely a fan. It was hot and humid with some decent waves; my perfect kind of day. Keegan and I decided we are going to take surfing lessons in the next few weekends. Watch out for that! You probably thought this was going to be an epic shot of us surfing. Not yet. Mid-afternoon, we took a break from the sun to go to World of Beer, which is SUCH a cool bar. It kind of reminds of Hopcat, though Keegan would kill me for saying that. Nothing could possibly rival, honey! We took advantage of their breakfast and bottomless Bloody Mary special. Holy cow. Us-1. World of Beer-0. The special is only $19, and a drink alone is $12. Give me some bottomless Zing Zang and Tito’s vodka, and call it a win! As their name suggests, they are known for their beer selection. They have 50 craft beers on tap, and over 500 bottles. 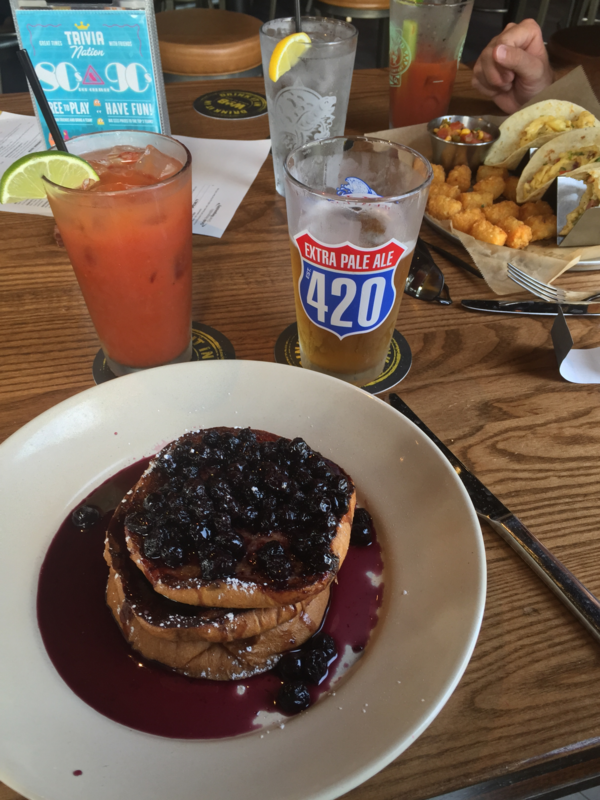 Their diverse drink selection and open atmosphere will definitely have us back again! After (obviously) Ubering it home, we relaxed, and Keegan brewed up a new batch of IPA. It’s fermenting in our office closet right now. Weird placement, but he thinks this batch will be great! We had an awesome weekend getting to know our city better and I can’t wait to keep exploring! Starting tomorrow, I’m going to do a Wordless Wednesday post every week, where the post is a picture instead of a blog. You know I will include some commentary, but let’s see how this goes. Books I’m Reading: Outlander by Diana Gabaldon. I’m only about 200 pages into the first book and already know I’m going to love the series. If you’ve read it-don’t spoil anything! My mom and Aunt Linda made me watch one episode with them, but it was the one where Jamie is in jail with Black Jack. AHHH. His hand! The nails! You are the most despicable, disgusting pathetic excuse for a man, Jonathen Randall! I could have puked. Favorite New Florida Thing: The geckos. These things are everywhere, and I love them. They’re always jumping around from sidewalk to stick. From stick to grass. From grass rock. The little things have nothing to do, and they’re so entertaining. Much less reprehensible than Black Jack to say the least.